Is there a drink more synonymous with suburban backyard mom parties than sangria? It’s a subcategory of punch that allows a hostess to pre-assemble a witch’s cauldron of wine and fruit guaranteed to keep her friends moderately intoxicated all afternoon with minimal kitchen effort. As such, it is genius. My mom, Linda, has a red sangria recipe that—while not hers originally—became attributed to her because so many friends and family requested it. (It in fact came from a fellow physical therapist she worked with in the ’90s.) My mom always had to assemble the sangria supplies during our family vacations to Florida, and I didn’t forget to ask for the recipe when I hosted my own post-college parties. 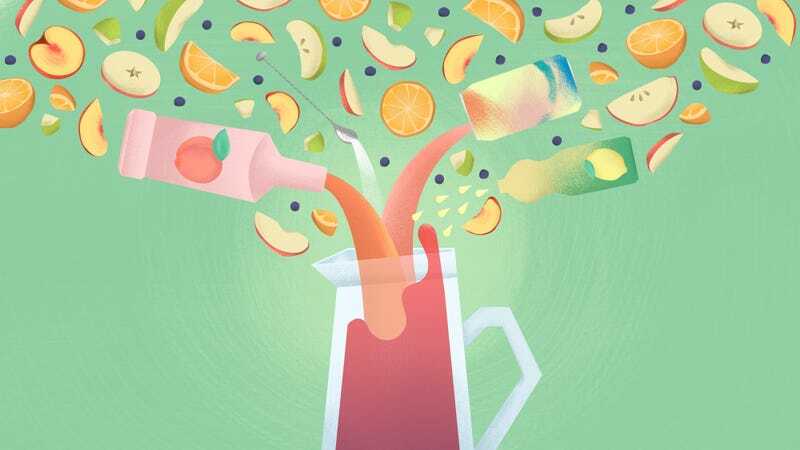 This sangria’s best quality is that while it’s cheap to make, it’s not so sweet as to cause an instant headache. It has some pleasant effervescence, fresh-cut fruit, a bit of citrus tang and a je-ne-sais-quoi fruit flavor that is, in fact, peach schnapps. When friends love it and want to know what’s in it, it’s satisfying to watch their faces when you tell them it all starts with an $8 jug of Carlo Rossi. Whip this up, raise a glass to Linda, and enjoy the first day of spring. 2 cups assorted sliced fruit: apples, oranges, etc. *Paisano is a Carlo Rossi brand that’s just slightly sweet. You could try substituting other red wines here, but why mess with perfection? Mix all ingredients—except the seltzer—together in a pitcher, making sure the sugar is dissolved, and allow to soak overnight. Before serving, add the seltzer and stir a few times. You can add the fruit before serving, if you don’t want it to turn red from the wine, but I prefer the way the fruit tastes when it’s soaked up the booze.